‘From the ground, we stand. From our ships, we live. By the stars, we hope.’ These are the final words chanted by all present at the end of a Naming Day ceremony – the celebration of new life performed by symbolically adding the footprint of the newly born to the archives on the Exodus Fleet. The Exodus Fleet is a collection of huge city-sized ships the last generations of Earth-born humans spent their lives building as the Earth died. The fleet was sent into space, the humans upon it swearing to start afresh and leave the bloody ways of their past behind. It’s very hard to talk about this book in under 300 words. Do I talk about how humans have made a nearly completely successful self-sustaining society – one with nary a sinister corporation or government in sight? Do I talk about their rituals – how deeply important it is when their loved ones die that they are turned into compost which grows the plants they eat? Do I talk about how suffocating it is for a teenage boy to stay on this small fleet when there is literally a galaxy full of aliens and planets to join? Do I talk about the human born on another planet who visits the Exodus out of a sense of loss the same way a third-generation immigrant might visit their grandparent’s home country? Do I talk about the alien Ghuh’loloan who studies us with the same profound curiosity as someone who studies apes (though with much more respect and self awareness)? 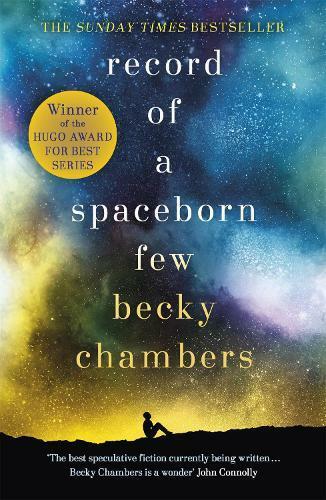 Record of a Spaceborn Few does what all Becky Chambers’ books do. It tells deeply personal stories set in an unimaginably vast setting. It’s an epic space adventure where everyone matters and no one is expendable. It’s a story that has you turning the final page buoyant with feelings of optimism and hope for the future of the human race.